Born in Manchester and an England Youth International, Jackie joined Manchester City as an amateur, but never made the first team. In November 1957, he signed for Blackburn Rovers on a free transfer. After just nine games and a single goal he was transferred to Accrington Stanley, (then still a football league club), where he spent two successful seasons playing 65 league games and scoring 28 goals. This success took him to Barnsley in June of 1961, where he scored 8 goals in 14 games before moving on to Workington in February 1962, where he spent the remainder of the 61/62 season and 1962/63. He made 61 league appearances there and scored 19 league goals, before moving on to Torquay United in July 1963. At Torquay, Swindells played 18 league games scoring 6 league goals, before moving again, this time to Newport County in July 1964/65, which was to be his last league club. Jackie played 23 league games there, scoring 3 league goals, mainly from midfield, before leaving for the North-West, for what were at the time, termed 'family reasons.' On his return to Manchester, Jackie, then 28 years old, joined up with Altrincham for the tail end of the 1964/65 season and his late introduction to the Altrincham side gave no indication of what was to come as he scored 4 goals in 10 games. In his first full season at Moss Lane he scored a phenomenal 82 goals in 63 games. In this total there were 6 hat-tricks, which included scoring five goals twice in a game (one of these being in the 6-0 1st Round FA Cup-tie against Scarborough) and seven in the 8-1 win over Chester Reserves. Over the rest of his Altrincham career he notched a further twelve hat-tricks. In that first full season (65-66) the 'Robins' scored 190 goals in all competitions with strike partner Pat Connolly, scoring 34 goals himself! They went on to clinch the Cheshire League Championship and were also league Cup Finalists. The following season they achieved the 'double' of League Championship and Cheshire Senior Cup. In fact, Swindells would see silverware in each of his six full seasons at Moss Lane. In 1967-68 Alty were runners-up in the League and were North-West Floodlit League runners-up. 1968-69 saw them win the North West Floodlit League and in 1969-70 Altrincham landed the Northern Premier League Cup and were also Cheshire Senior Cup finalists. In 1970-71, Jackie's last season, he went out on a high as Altrincham defeated Macclesfield to win the North west Floodlit League trophy yet again. Lennie Dickinson gave nothing less on the pitch than 100%. He was a hard-tackling, inspirational all action mid-fielder who was always capable of scoring crucial goals wherever he played. He was born on 6th March 1942 in South Elmsall, Yorkshire and initially made little impact as a schoolboy footballer but within months of leaving school and playing youth club football he had a host of League clubs queuing up to sign him. 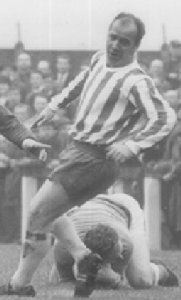 Lennie eventually signed for Sheffield Wednesday in February 1960, but without making the first team, he joined Oldham Athletic for a £100 fee in June 1961. From Oldham, Lennie moved into non-league football with Witton, joining Altrincham for one season in 1962-63. After scoring 22 Goals in that season, Altrincham manager Charlie Mitten released him! He then joined Witton and Buxton, before arriving at Don Wilson's Mossley in January 1966, where he spent 7 successful years, winning the Club's first 'Player of the Year' award in 1972 and finishing as leading goal scorer in 1968-69. In all Lennie made a total of 338 appearances for Mossley and scored 84 goals. Lennie returned to Altrincham in December 1972 and became team captain and inspiration to a side that would put Altrincham FC on the map. He had five good seasons at Moss Lane, even acting as caretaker manager along with Tommy Spratt prior to Tony Sanders's appointment After leaving Altrincham, Lennie had spells with Chorley and Leek Town, followed by a brief spell as assistant manager at Droylsden. John King is someone who needs no introduction to 'Alty' fans and is a man whose name will be forever linked with the history of Altrincham F.C. as a player, a manager, a director and one time saviour of the club. 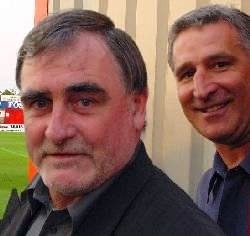 John first appeared at Moss Lane playing as a 21-year-old centre back for Kirby Town in 1971 but had started his career with Everton and Shrewsbury Town. After Kirby John moved on to Wigan Athletic and Northwich Victoria before arriving at his spiritual home Moss Lane in November 1977 for £3,500, as one of the final parts in Tony Sanders team building programme. His deeds are legendary, scoring the third goal at Wembley, to seal Altrincham's first FA Trophy win, clashing with 'Ossie' Ardiles of Spurs in the FA Cup, leading the side to two back to back Alliance Premierships and saving the club from virtual extinction at the 11th hour. Every Altrincham fan has their favourite 'Kingy' memory (and let's be honest there were plenty of them). Regarded as a "hardman" and natural successor to Lennie Dickinson as a 'lead from the front' type of player John also possessed considerable skill and the ability to score crucial goals. His playing career ended at Wembley against Enfield in the FA Trophy and from there he went into management with South Liverpool, returning to Moss Lane to replace Tony Sanders in January 1984. He left in May 1986 (after winning the FA Trophy) but returned in May 1988 after a spell at Runcorn, only to leave again in July 1991 to manage Barrow and then act as assistant manager at Bury. He returned yet again with the sacking of Paul Rowlands in February 1994 to save the club from relegation (along with Graham Heathcote). John King will always be remembered at Moss Lane, a true Colossus and one worthy to stand in the pantheon of 'Alty' legends.